Salamat Datang!!! Welcome to Langkawi. On arrival at the Langkawi International Airport, you will be met and transferred to your hotel. While the rest of your day is free at leisure. Stay overnight at the hotel. After breakfast, proceed for a half day island tour of Langkawi. 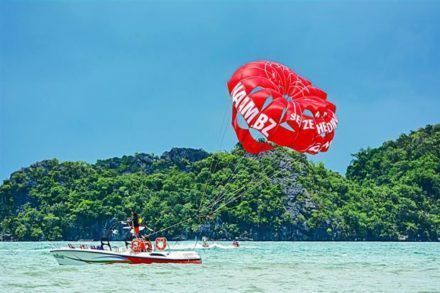 A fascinating tour that will take you through the urban and rural areas of Langkawi – the Legendary Island. Begin your journey with a visit to the Atma Alam Handicraft Center and then to the legendary Mahsuri Tomb. Then, visit the Eagle Square and the duty-free Kuah Town. Stay overnight at the hotel. After breakfast, check out of the hotel and get transferred to the Langkawi International Airport for your flight to Kuala Lumpur. Arrive Kuala Lumpur and check in to the hotel, while the rest of your day is at leisure. Stay overnight at hotel in Kuala Lumpur. After breakfast, proceed for a half day City Tour of Kuala Lumpur which includes Photo Stop at Kings Palace, China Town, Notional Monument, National Museum, National Mosque, Shopping Stop, Independences Square OR Anglican Church, sultan Abdul Samad building, Twin Tower & Batu Caves. Stay overnight at hotel in Kuala Lumpur. After your breakfast in Kuala Lumpur, transfer to the Kuala Lumpur International Airport for your flight back to homebound.